Jany View's Blog: OMISORE DECLARES WANTED- EFCC. 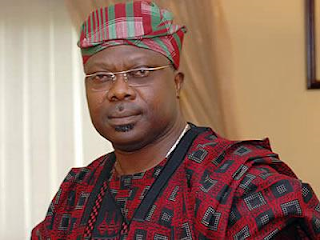 The Economic and Financial Crimes Commission, EFCC, Tuesday, said it has declared Senator Iyiola Omisore wanted. According to the EFCC, Omisore, a former Deputy Governor of Osun State, is wanted for receiving N700 million from the immediate past National Security Adviser, NSA, Sambo Dasuki. The anti-graft agency, in a statement posted on its official Facebook page, said Omisore had been evading arrest for several months and it thus had no choice but to declare him wanted. The statement read: “The EFCC, today, May 24,2016, declared a former deputy governor of Osun State, Senator Iyiola Omisore wanted.